When you get right down to it, an investment in energy is an investment in everything. The alarm that wakes you up; the coffee that gets you going; the car, bus, or train that gets you to work; the food that fuels your body... Almost every part of our lives requires energy. It’s the most ubiquitous investment in the world. It truly plays a part in every aspect of our lives. You see, energy stocks are some of the most reliable income-generating investments ever. Utility stocks are known as the investments of widows and orphans. And this is because they provide steady, reliable income year in and year out. In bull markets, they deliver stellar gains along with steady income. And in recessions, they’re the last stocks to drop and the first to come back up. As you can clearly see, the best of the best — the ones delivering the highest returns — are stocks with growing dividends. These are the kinds of companies you hold onto forever. They’ll boost your gains while you prepare for retirement and pay you monthly income while you enjoy the retirement you worked so hard to attain. And it’s surprisingly easy to find them — especially in the energy industry. Some of the most tenured of the dividend growers are oil and gas companies. And most oil services companies pay some kind of dividend. Most companies in the industry have preferred shares that pay regular income. And then there are the MLPs (master limited partnerships) and royalty trusts. These are investments that are literally set up to pay income to their investors. MLPs provide quarterly distributions to shareholders, much like a dividend payment. But in the case of an MLP distribution, the money you receive is treated as a return of capital and not income when it comes time to pay taxes. This means that you get to pay the lower capital gains tax as opposed to the much higher personal income tax. Royalty trusts are just that: They pay investors royalties on the profits from sales of oil, natural gas, solar energy, etc. They’re not companies, per se, because there are no operations and very few employees. But there’s a management board that's responsible for tracking profits and distributing payments to shareholders. And they also offer some of the highest yields on the market. 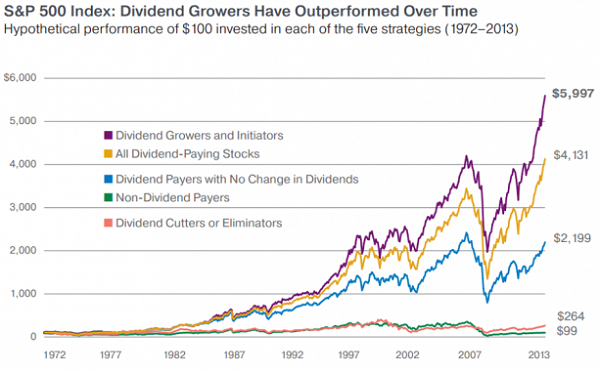 You now have an idea of the kind of profits you’ll see from dividend investments. You understand how important they are when it comes to having income in retirement. And you know that there are tons of options out there for getting some income into your energy investments. Let’s start with a solid (and high-yielding) MLP. Williams Partners L.P. (NYSE: WPZ) is an energy infrastructure company. It has a hand in pretty much every part of the oil and gas life cycle and helps producers gather, treat, and compress newly recovered oil and gas. It provides for transportation and processing and is even involved in the marketing of final products. And it pays investors a very nice 6.09% quarterly payment, which works out to $2.40 per unit, per year. And it’s paid that dividend steadily since it was started in 2005. You won't be getting blazing rallies in this stock, but you can always depend on its payments hitting your bank account every three months — no matter what. Next up, let’s go with a dividend grower. It’s a name you’re probably very familiar with: ExxonMobil (NYSE: XOM). But you might not know that Exxon has one of the longest-running dividend programs in the market. It’s been paying investors steady incomes for more than a century. Exxon started paying a dividend back in 1911. And it’s managed to keep those payments going through multiple market collapses, including the Great Depression. The company has also been raising that dividend payment every year for the past 35 years. Even during the Great Recession and the recent rout in oil prices, XOM kept giving investors raises. In fact, it’s averaged a 6.4% annual growth rate. This is just what you want in your energy income portfolio. The stock currently has a 3.74% yield, which works out to $3.08 per share per year. Finally, I have an investment for those of you who want to have a little skin in as many games as possible. It’ll give you investments in 33 different dividend-paying players in the energy market. You'll get exposure to exploration and production companies, midstream transport companies, refiners, and even companies that sell to the general public. And the best part is that you'll also get to collect a dividend yield that’s a combination of all 33 of those payments. The Energy Select Sector SPDR Fund (NYSE: XLE) pays investors a 5.06% yield, which works out to about $3.46 per unit per year. And it’s been paying those quarterly distributions since the fund’s inception back in 1999. Finding stocks that generate lasting (and growing) income is one of my specialties. It’s the backbone of my own investment strategy. I co-run a service called The Wealth Advisory where we clue investors into the best income-generating investments in the market. Our readers invest in companies that will be paying out a growing stream of income for decades to come. And it’s because of this strategy that Keith Kohl has asked me to help him in creating a portfolio of the absolute best income-generating energy investments on the market. Both of us want you to have access to the kinds of stocks that will secure your retirement. And we want to make sure that you have plenty of money coming in after you stop working to not only support your lifestyle but to also provide a nest egg to pass on to your children. It will take a lot of research and many late nights crunching numbers, wading through balance sheets, interviewing executives, and probably traveling to check out operations. But it’s all worth it, knowing that you’ll be able to build a portfolio to help you reach your goals of a comfortable retirement that much quicker. And once we have all the stocks figured out, you’ll be the first to get access to this portfolio of all-star, income-generating energy stocks. Until then, get your feet wet with the three companies I outlined above. I’m sure they'll be able to boost your returns and whet your appetite for more income.